“My name is Lorenso. I have been in Gilroy close to 30 years. After moving here the first thing I noticed about Gilroy was how quiet it was. The police didn’t know me then, because I had a job. I’ve been homeless now for 15, 16 years. Honestly, it’s not good. You get a red tag, every time you stay one place for too long or if they think there’s too much mess. There’s no place to throw the mess. There’s nothing you can do with your garbage, except let it pile up. And when you’re homeless and you’re made to move, you just move from one place to the next. It’s just a big vicious circle, which never ends, unless you get some type of assistance. I’ve been through two fires. Twice I’ve lost everything I own. 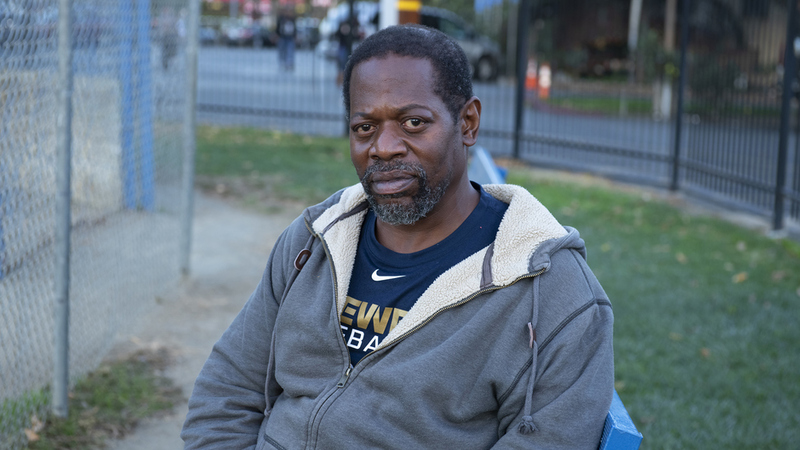 I had bladder surgery, had cancer and I’m still on the streets. For the past eight years or so I’ve been promised a house or apartment. Nothing’s happened. I don’t expect it anymore, because I know it’s not going to happen. My friend who is Mexican used to tell me, “The only reason you’re not getting things done here, in this city, is because you’re black.” I didn’t believe him, but now I’m starting to believe that to be true. It’s a shame, but nobody’s going to get me to leave. I love it here, even if I’m homeless. It’s difficult looking after your stuff, when you’re homeless. And I’m looking after my nephew’s stuff too. He’s in hospital having surgery for a broken ankle and can’t look after it himself. You can’t leave your stuff anywhere. Somebody is sure to come behind you and take it. In this bag I am carrying everything that I own, everything that is important to me: my medical records, my appeal documents, my clothes, my deodorant, my toiletries and a little food. I don't put much into this bag or it’s a dead weight. I travel as light as possible. I don't have anything sentimental in here. Everything like that has been lost in the fires - all my records, everything. All I have are the promises that people gave to me. “Oh, we’re going to do something to help you. We’ve put you on the list.” Nothing ever happens. I don't know what it would take for something to happen - probably a calamity. I don't want to be another statistic, another death from drowning or from the cold, from sleeping in the tunnel or some other place that’s not supposed to be inhabited by human beings. That’s the thing, we are humans. We are not animals. We deserve some happiness in life: - waking up in a house that you know is going to be there tomorrow; not worrying about whether your clothes are going to be there, when you get back; having water, having light, having enough to eat. It’s not all about money. We just need the chance to make our mark, to do something with our lives, to become a plus to society, instead of a minus. When you're in survival mode, you’ll do whatever it takes. Most of us have to sedate ourselves and stay sedated, so that we can deal with life. I’m feeling something is going to come my way sooner or later. I’m not going to give up, ever. We may be tired of moving on, but we’re not going to give up. We live here. I understand that you want to give people hope, but don't lie to us. Treat us like humans. We are humans, don't look at us in the store, as though we smell. You think we’re going to spend money on drink. I can’t drink. I have cancer and I’m still having treatment. There’s almost no help for cancer patients. After my surgery I lost everything in a fire. I wasn’t feeling too good after all that. I just got $20 from the police and fire department. What about spending money on what we need? Some people come to the end of the road and break down, but I’m strong. I’m not here to break down. I’m going to get what I deserve.